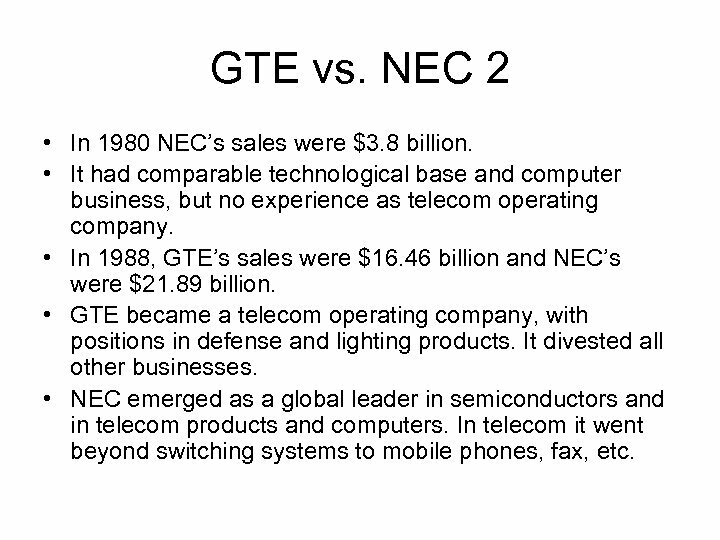 GTE vs. NEC 1 • In the early 1980 s, GTE was poised to be a major player in IT industry, with a variety of businesses including telephones, switching and transmission systems, semiconductors, satellites and defense systems. • GTE’s entertainment products group produced Sylvania color TVs & display technologies. • In 1980 GTE’s sales were $9. 98 billion and net cash flow was $1. 73 billion. 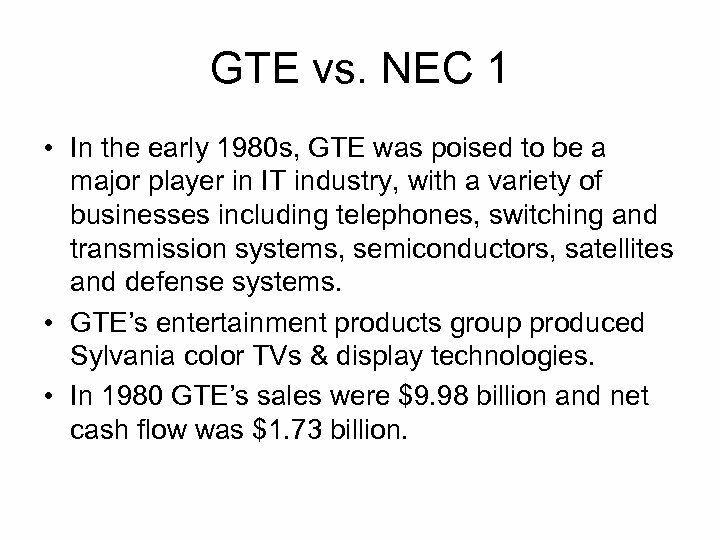 GTE vs. NEC 2 • In 1980 NEC’s sales were $3. 8 billion. • It had comparable technological base and computer business, but no experience as telecom operating company. • In 1988, GTE’s sales were $16. 46 billion and NEC’s were $21. 89 billion. • GTE became a telecom operating company, with positions in defense and lighting products. It divested all other businesses. • NEC emerged as a global leader in semiconductors and in telecom products and computers. In telecom it went beyond switching systems to mobile phones, fax, etc. 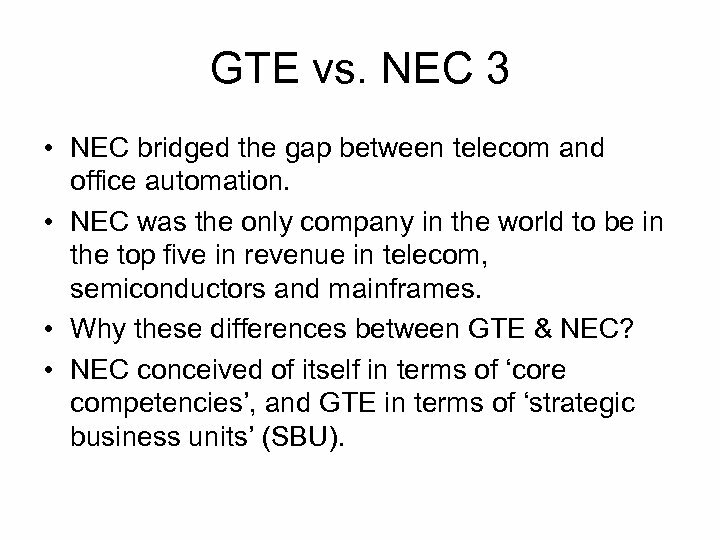 GTE vs. NEC 3 • NEC bridged the gap between telecom and office automation. • NEC was the only company in the world to be in the top five in revenue in telecom, semiconductors and mainframes. • Why these differences between GTE & NEC? 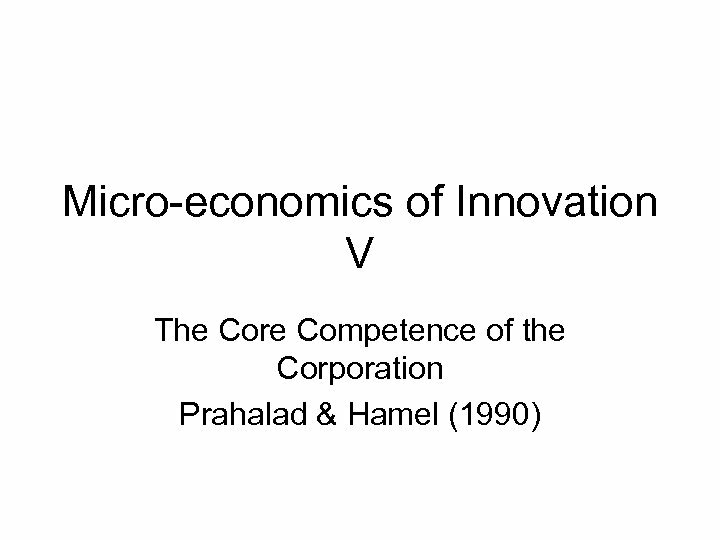 • NEC conceived of itself in terms of ‘core competencies’, and GTE in terms of ‘strategic business units’ (SBU). 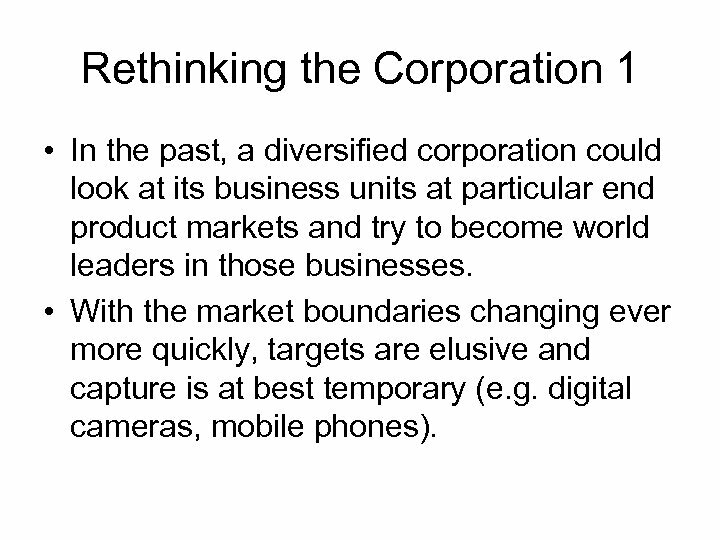 Rethinking the Corporation 1 • In the past, a diversified corporation could look at its business units at particular end product markets and try to become world leaders in those businesses. • With the market boundaries changing ever more quickly, targets are elusive and capture is at best temporary (e. g. digital cameras, mobile phones). 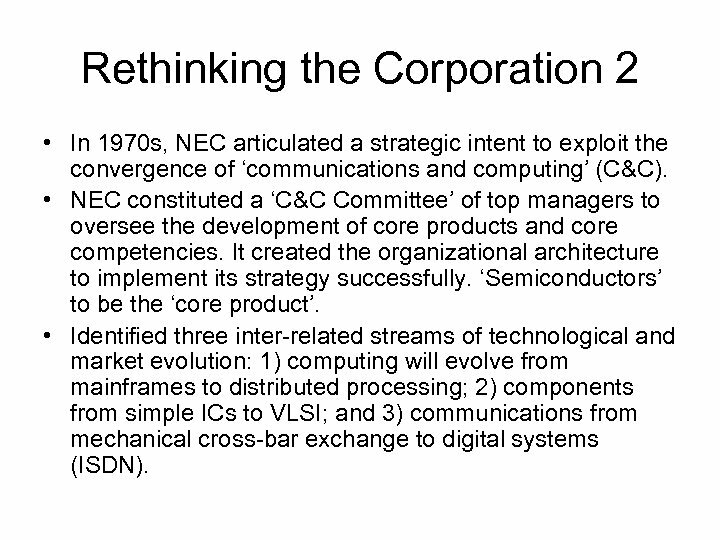 Rethinking the Corporation 2 • In 1970 s, NEC articulated a strategic intent to exploit the convergence of ‘communications and computing’ (C&C). • NEC constituted a ‘C&C Committee’ of top managers to oversee the development of core products and core competencies. It created the organizational architecture to implement its strategy successfully. ‘Semiconductors’ to be the ‘core product’. • Identified three inter-related streams of technological and market evolution: 1) computing will evolve from mainframes to distributed processing; 2) components from simple ICs to VLSI; and 3) communications from mechanical cross-bar exchange to digital systems (ISDN). Rethinking the Corporations 3 • NEC reasoned, the computing, communications, and components businesses would overlap blurring the distinction between them. • NEC entered into strategic alliances (over 100 in 1987) aimed at building competencies rapidly and at low cost, with a goal of internalizing partner skills. 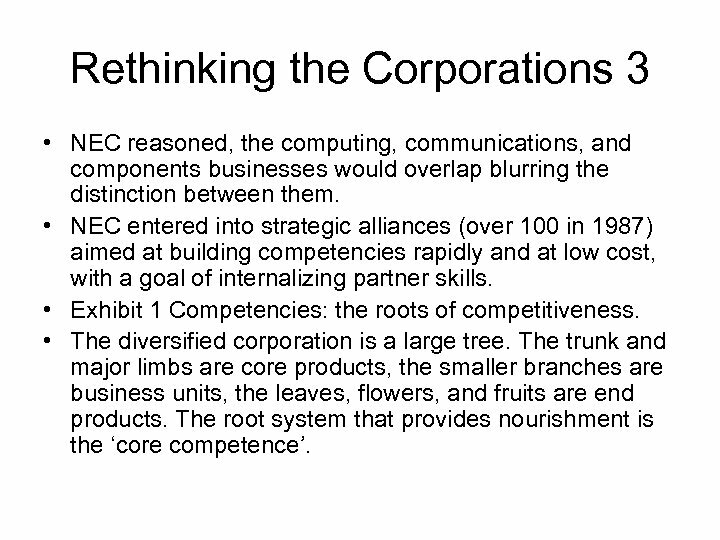 • Exhibit 1 Competencies: the roots of competitiveness. • The diversified corporation is a large tree. The trunk and major limbs are core products, the smaller branches are business units, the leaves, flowers, and fruits are end products. The root system that provides nourishment is the ‘core competence’. Core Competencies 1 • Core competencies are the collective learning in the organization, especially how to coordinate diverse production skills and integrate multiple streams of technologies. 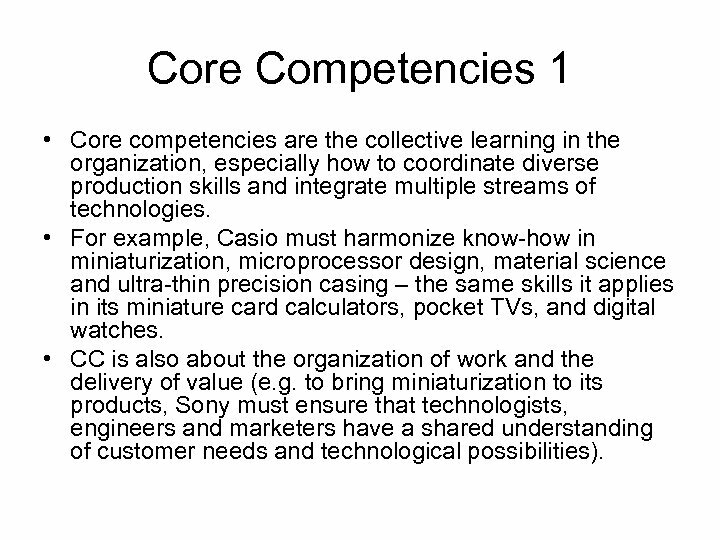 • For example, Casio must harmonize know-how in miniaturization, microprocessor design, material science and ultra-thin precision casing – the same skills it applies in its miniature card calculators, pocket TVs, and digital watches. • CC is also about the organization of work and the delivery of value (e. g. to bring miniaturization to its products, Sony must ensure that technologists, engineers and marketers have a shared understanding of customer needs and technological possibilities). 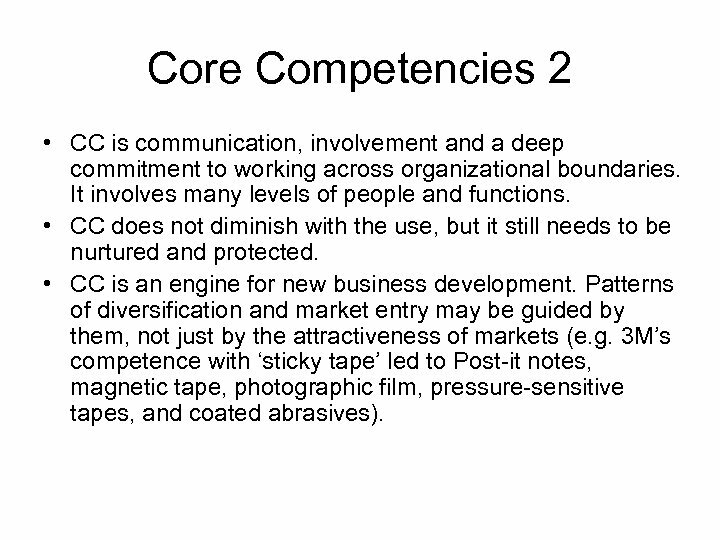 Core Competencies 2 • CC is communication, involvement and a deep commitment to working across organizational boundaries. It involves many levels of people and functions. • CC does not diminish with the use, but it still needs to be nurtured and protected. • CC is an engine for new business development. Patterns of diversification and market entry may be guided by them, not just by the attractiveness of markets (e. g. 3 M’s competence with ‘sticky tape’ led to Post-it notes, magnetic tape, photographic film, pressure-sensitive tapes, and coated abrasives). 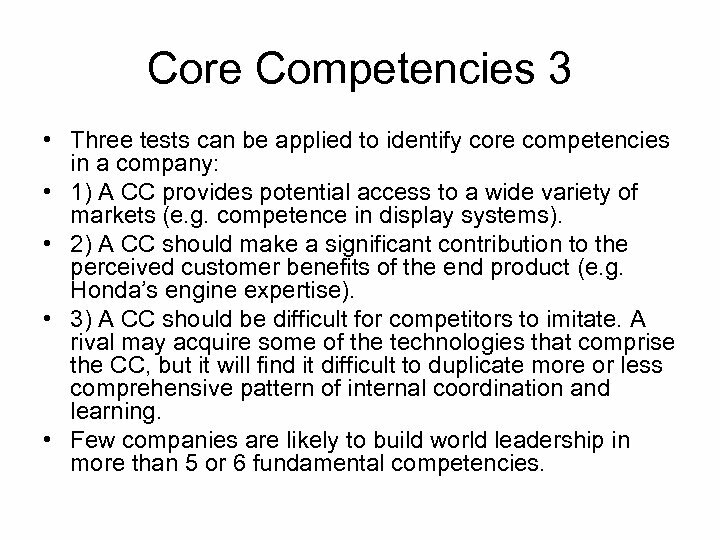 Core Competencies 3 • Three tests can be applied to identify core competencies in a company: • 1) A CC provides potential access to a wide variety of markets (e. g. competence in display systems). • 2) A CC should make a significant contribution to the perceived customer benefits of the end product (e. g. Honda’s engine expertise). • 3) A CC should be difficult for competitors to imitate. A rival may acquire some of the technologies that comprise the CC, but it will find it difficult to duplicate more or less comprehensive pattern of internal coordination and learning. • Few companies are likely to build world leadership in more than 5 or 6 fundamental competencies. 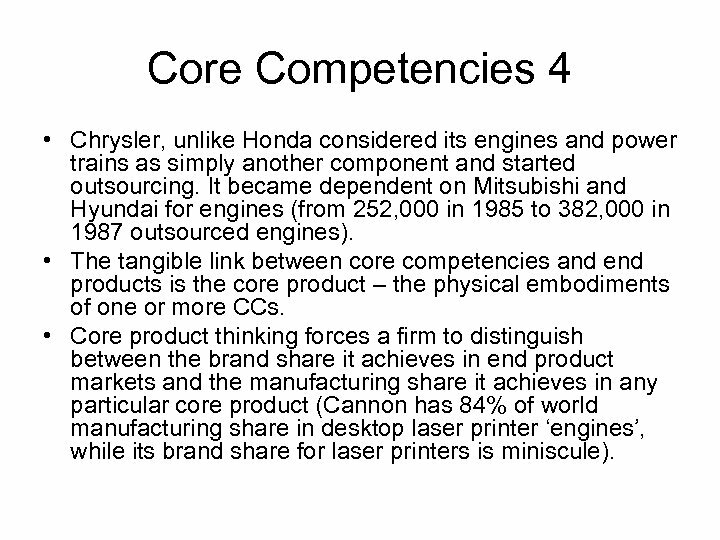 Core Competencies 4 • Chrysler, unlike Honda considered its engines and power trains as simply another component and started outsourcing. It became dependent on Mitsubishi and Hyundai for engines (from 252, 000 in 1985 to 382, 000 in 1987 outsourced engines). • The tangible link between core competencies and end products is the core product – the physical embodiments of one or more CCs. • Core product thinking forces a firm to distinguish between the brand share it achieves in end product markets and the manufacturing share it achieves in any particular core product (Cannon has 84% of world manufacturing share in desktop laser printer ‘engines’, while its brand share for laser printers is miniscule). Core Competencies 5 • SBU thinking leads to: • 1) underinvestment in developing CCs and core products; • 2) imprisoned resources (a CC remains within the business unit); • 3) bounded innovation. 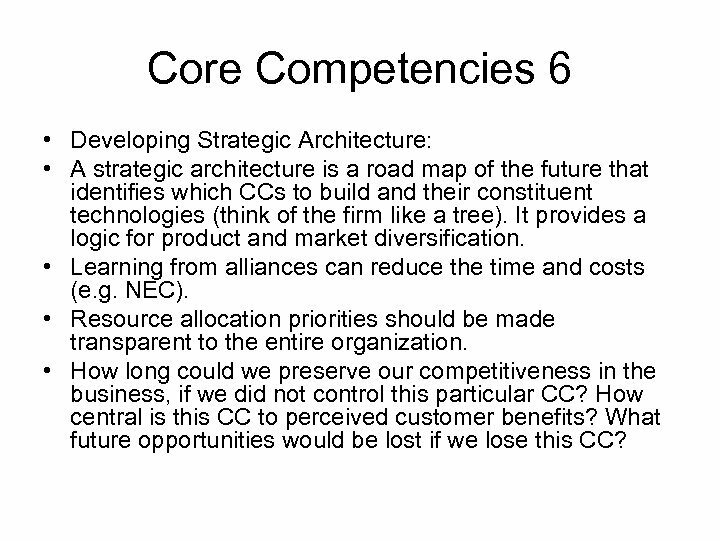 Core Competencies 6 • Developing Strategic Architecture: • A strategic architecture is a road map of the future that identifies which CCs to build and their constituent technologies (think of the firm like a tree). It provides a logic for product and market diversification. • Learning from alliances can reduce the time and costs (e. g. NEC). • Resource allocation priorities should be made transparent to the entire organization. • How long could we preserve our competitiveness in the business, if we did not control this particular CC? How central is this CC to perceived customer benefits? What future opportunities would be lost if we lose this CC? Core Competencies 7 • Redeploying to Exploit Competencies: • CC should not be held hostage by any particular business. SBU should bid for a CC the same way it does for capital (top management). • Send a signal to middle managers that CCs are corporate resources and could be reallocated by the corporate management. • SBUs are entitled to the services of individual employees so long as they show effective pay-off. • The key employees should be weaned away from thinking that they permanently belong to a particular SBU. • Exhibit 2 Cannon.